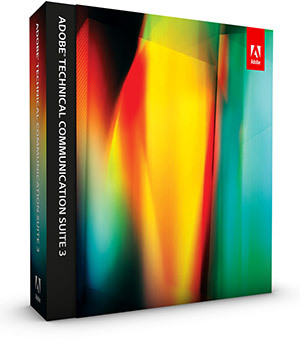 Adobe Technical Communication Suite (TCS) 3 is Now Shipping! Efficiently author & publish documentation to multiple channels & devices. Adobe® Technical Communication Suite 3 is a complete, single-source authoring toolkit with multichannel, multidevice publishing capabilities. TCS 3 comprises five major Adobe applications tightly integrated together into a single package. Develop repurposable standards-compliant content with FrameMaker® 10, publish in various formats with RoboHelp® 9 and Captivate® 5 workflows, collaborate with reviewable PDF files (via Acrobat® X Pro), incorporate rich multimedia assets and images using Photoshop® CS5 and Illustrator® CS5†, and add demos and simulations using Captivate 5. Publish to XML, HTML, DITA, SCORM, Adobe AIR®, print, PDF, as well as a variety of mobile devices via a single click. Expanded multichannel and multidevice publishing capabilities – Easily create standards-compliant content and generate output in multiple formats, including print, PDF, Adobe AIR®, WebHelp, XML, and HTML, to deliver your content to a wide range of devices, such as eBook readers, smartphones, and tablets. Enhanced FrameMaker® and RoboHelp® integration – Take advantage of RoboHelp from within FrameMaker without switching between applications. With more robust and tighter integration between the two products, you can perform all authoring and publishing tasks within your preferred authoring environment. Comprehensive support for industry standards – Author DITA-compliant content in FrameMaker, and generate EclipseHelp and IETP output and eLearning modules. Improved review workflows – Use FrameMaker and RoboHelp to create commenting-enabled PDF files that can be reviewed using free Adobe Reader® for collaborative reviews. You can then import comments back into FrameMaker. Versatile rich media integration – Make your content more engaging by adding multi­format videos, animation, show-me demos, 3D objects, and graphics from within the FrameMaker authoring environment. Out-of-the-box integration with Illustrator CS5† – Leverage rich media capabilities and directly edit Illustrator files from within the FrameMaker authoring environment without switching applications. Faster eLearning content creation – Use Adobe Captivate from within the FrameMaker authoring environment to edit or create eLearning content without switching applications. Enhanced image-editing capabilities – Edit images with Adobe Photoshop CS5 without leaving the native FrameMaker authoring environment. Single-sourced help content – Dynamically link FrameMaker content in RoboHelp. Make changes in the original file and then select Update in RoboHelp to make on-the-fly updates and directly link DITA files. Adobe AIR support – Publish your technical content as an AIR application with support for adding multiple tabs, favorites, RSS feeds, new templates, and auto-generated mini tables of contents. Take advantage of advanced features such as commenting and online-offline synchronization. Powerful image processing – Enliven your technical communication with Photoshop CS5, the industry-leading application for enhancing images. Achieve amazing results by creating composites. Now you can easily remove an unwanted area from an image without being an expert graphics designer. Customizable FrameMaker interface – Take advantage of a customizable workspace. You can also dock frequently used dialog boxes to more easily view, navigate, and edit documents. RoboHelp template and style enhancements – Improve your workflow with support for master page creation as well as advanced layout features, such as breadcrumbs, mini tables of contents, and “see also” references. Define and edit table and list styles with an enhanced CSS style editor. Engaging, interactive content – Bring engaging technical communications to life with support for 3D, SWF files, XML, and DITA. FrameMaker and RoboHelp integration – Import FrameMaker content into RoboHelp with support for the new hierarchical structure of FrameMaker books, directly link DITA maps, automatically convert table and list styles, and publish multiple RoboHelp outputs from within the native authoring environment. Full support for DITA standards – Take advantage of full DITA 1.1 and DITA 1.2 support to develop compelling training content. Complete and integrated solution – Easily work with the tools you need for authoring technical information, including books, documents, online help systems, knowledgebases, interactive training, and eLearning content. Best-in-class software components – Work with full new versions of Adobe professional tools for technical communicators, user assistance specialists, and instructional designers, including FrameMaker 10, RoboHelp 9, Adobe Captivate 5, Acrobat X Pro, and Photoshop CS5. †Adobe Illustrator CS5 is not part of the suite and would be purchased separately. *Adobe CS Live online services are complimentary for a limited time. Learn more, or download an 8-page TCS family brochure or a free trial.